The latest in sport discs feature wide aperture slots that draw cool air into the braking contact area and reduce temperatures preventing brake fade. Dimple drilling avoids stress cracks and the thermic black coating provides great looks whilst preventing corrosion. 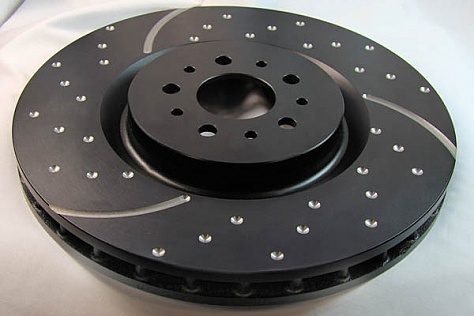 EBC sport discs now feature reduced 3 slot venting which provides slightly less air noise under heavy braking whilst still maintaining the benefits of cooler running with the full width slot design. 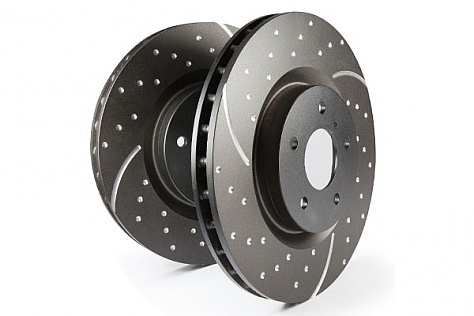 The design of these discs means that some wind noise is observed and if drivers feel they would find this offensive they are advised to select the quieter USR Ultimax series or the EBC plain disc. Another great feature of slotted discs is the way they MAINTAIN FLAT AND PARALLEL PAD WEAR and avoid the record grooves or galling common with non-slotted discs. This improves pad contact and braking throughout the life of the disc and pad set.